How is MSE at UMD Working with Nanotechnology? One of our students using a transmission electron microscope (TEM) during a class. One of the most interesting things about nanotechnology is that the properties of many materials change when the size scale of their dimensions approaches nanometers. 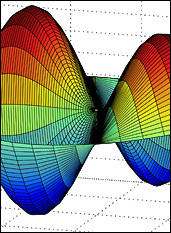 Materials scientists work to understand those property changes and utilize them in the processing and manufacture of materials at the nanoscale. The field of materials science covers the discovery, characterization, properties, and end-use of nanoscale materials. Most other engineering majors work with nanotechnology, but materials science and engineering is at the heart of it across all disciplines. For those who are passionate about nanotechnology, MSE is place to be for the most research, coursework, and experience in nanotechnology. 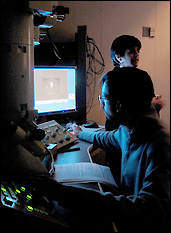 Our department also administers the Clark School's Interdisciplinary Minor Program in Nanoscale Science and Technology, a program open to any student majoring in Engineering, Physics, or Chemistry. When Things Get Small - "What could a stadium-sized bowl of peanuts, a shrinking elephant, and a crazed hockey player have to do with nanoscience?" Adam Smith and Ivan Schuller from the University of California San Diego (UCSD) will tell you in this Emmy Award-winning short film. Weird, Weird Science: John Sizemore offers a movies on a variety of topics on his Dailymotion site. 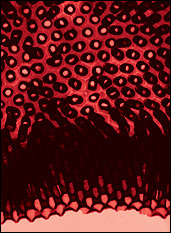 His "Zoom Into..." series of videos about materials includes Zoom Into A Carbon Fiber. This is a carbon nanotube, just a bit over 1 nanometer in width (100 nanometers is 1000 times smaller than the width of a human hair). Nanotubes are up to 100 times stronger than steel at only 1/6 the weight. They have a thermal conductivity near that of diamonds, and an electrical conductivity that can exceed that of copper. 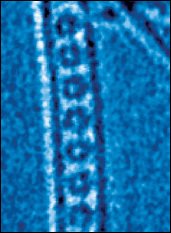 Inside this nanotube are "buckyballs", spherical carbon molecules. This combination has the potential to be used to create nanomechanical structures. Professor Oded Rabin's research group is modeling the efficiency with which a nanowire can convert heat into electrical energy. Professor Gary Rubloff's research group is designing nano-sized structures capable of storing solar or wind energy 10x more efficiently than what is currently available.